Are you searching for the best rates for your Lexmark laser toner cartridges? If your laser printer is running low on laser toner you could get fabulous savings as a result of getting your new Lexmark E360-dn toner cartridges from Cartridge Save. With our competitive prices and also our low price policy, you'll be certain of receiving the very best offer on your Lexmark E360dn toner cartridges. It's Cartridge Save's mission to meet the needs of each and every shopper by offering great rates along with Lexmark E360dn toner which have been manufactured to rigorous standards. Here at Cartridge Save you will get speedy and free delivery for Lexmark toners. This specific great value Lexmark E360dn toner cartridge may be paid for at our checkout page so don't lose out and buy as soon as you can while stocks last. We an industry leading customer support team that will make sure that buying Lexmark E360-dn toner is a fast and easy experience. Customer care is Cartridge Save's biggest priority and so we offer you a guarantee on all Lexmark E360dn toners to be certain that you receive 100% customer happiness. For the cheapest offer on Lexmark E360dn laser toner cartridges you can't beat shopping at Cartridge Save. The Lexmark E360dn is a monochrome, single function laser printer that is network ready, and is compatible with Mac OS X, Linux, and Windows operating systems. It comes standard with a 50 sheet multipurpose paper tray, 32 MB of memory, and is energy efficient certified. A front mounted LCD panel, and six control buttons provide the user with all the needed functions to control the printer. Designed for small office workgroups, the Lexmark E360dn toner comes in two sizes to accommodate differing workloads. There is flexibility in connection options as well, because the E360dn includes a standard IEEE 1284 parallel port, a 10/100Base TX Ethernet jack, and a high-speed USB 2.0 port. 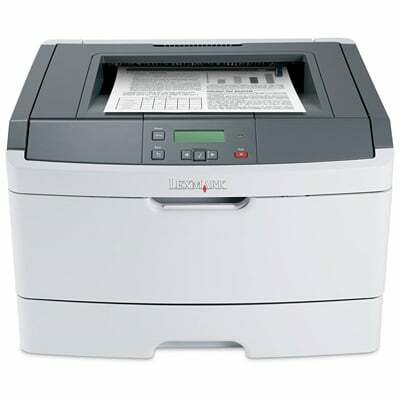 Styled in 2 tones of gray, and designed with versatility in mind, the E360dn offers upgradeable memory of 128 MB or 256 MB to provide fast print jobs without computer slow-downs. The E360dn's paper tray capacity can be upgraded to hold 250 sheets of paper, and it can handle paper weights ranging from 16 to 24 pound. Because office needs are so varied, this printer supports a variety of media sizes and types, including printing on card stock and transparencies. The Lexmark E360dn is a workhorse with a small footprint. This powerful laser printer takes up about the same amount space as a medium size microwave oven. Rest assured, this Lexmark will fit onto any desk or table in the office. Moreover, its sleek, curved outer styling will make it a welcomed addition to any workplace. Printing at speeds of up to 40 pages per minute, the E360dn will produce its first page in only 6.5 seconds, produces print in resolutions of 1,200 x 1,200 dpi, has built-in duplexing, and a monthly duty cycle of up to 80,000 pages. Changing the Lexmark E360dn toners is a snap, thanks to a conveniently located access panel at the top-front of the machine. Unfortunately, this printer provides a minuscule LCD display consisting of 2 lines, or 128 x32 pixels. However, since it is a single function printer, there is not much need for a large sophisticated display.